I was in the checkout line at the grocery yesterday when I spied the new Southern Living Weddings. Tenn Hens was featured in the magazine last year so I was dying to check it out. It was crazy to see some of our work in print! 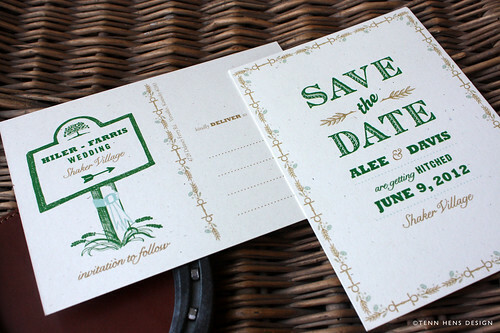 Since the feature came out we've had lots of lovely folks contact us about designing invitations. In fact, we are currently working with a Kentucky bride on all her wedding materials. Here's a sneak peek of the save the date and the rest we'll share soon. Now, I'm off to flip through my copy of the new issue.